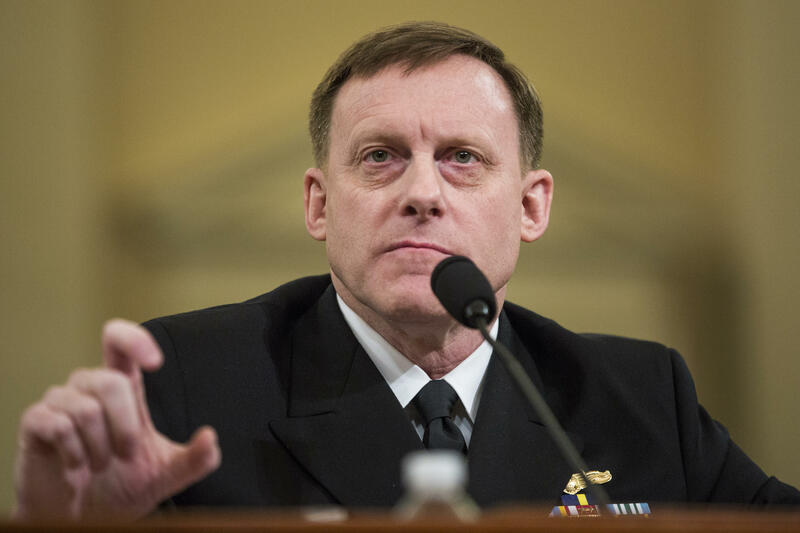 WASHINGTON -- Former National Security Agency Director and commander of U.S. Cyber Command Admiral Mike Rogers said in rare public remarks on Tuesday that, contrary to media reports, he "never had a discussion" about collusion with President Trump or other White House officials. "I've never had a discussion with collusion with the president of the United States," Rogers said. "I've never been directed to do anything, coerced -- any time I had a discussion I felt I was able to say, 'Hey, here's my view on that,'" Rogers said, "I'm very comfortable." Asked specifically about reports in May 2017 that Mr. Trump had asked Rogers and Director of National Intelligence Dan Coats to publicly deny evidence of collusion between Russia and the Trump campaign, Rogers said, "I was never asked that." He added with characteristic acerbity that if he spent his time correcting media reports, "I'd never get anything done." Rogers declined to comment when moderator Nicolle Wallace pressed him on further details from the Washington Post's original story on the conversations between Mr. Trump and his intelligence chiefs, including whether an NSA official took contemporaneous notes about Rogers' conversation with Mr. Trump. "No comment," he said on stage with three other former intelligence officials at an event called "Secrets, Presidents and Dissent," held at George Mason University's Schar School of Policy and Government. Rogers, who retired from his dual-hatted role and the Navy on June 1 after serving during both the Obama and Trump administrations, also said he wished Mr. Trump had pushed back more firmly on Russian president Vladimir Putin during the Helsinki summit held in July. "I thought there was an opportunity there that I wish we had taken advantage of," Rogers said. "I thought that could have sent a very powerful message." Rogers also indicated that the Trump administration had granted Cyber Command additional authorities to combat Russian attacks, meaningfully updating his testimony before the Senate Armed Service Committee in February. "You can tell over time we were moving in what I thought was a very positive direction, definitely," he said. "The leadership clearly was part of that… in the sense of formally directing change." "I was glad to see the broad direction that we were moving in, I'm not going to pretend for a minute it's perfect by any stretch of the imagination," he added. Rogers was an outlier among the event's other panelists, who included former NSA and CIA director Michael Hayden, former Director of National Intelligence James Clapper, and former career CIA analyst Phil Mudd. Apart from Rogers, all of the panelists signed letters, circulated among former senior intelligence officials, protesting Mr. Trump's decision last month to revoke former CIA director John Brennan's security clearance. Brennan calls Trump's denial of Russia collusion "hogwash"
"I felt it was my duty, my obligation, to speak up," Clapper said, though he acknowledged receiving "blowback" from both intelligence and military officials. For his part, Rogers said he "chose not to" sign a letter – despite agreeing with the fundamental premise that citizens are entitled to express their views – out of concerns about the effectiveness of the measure and whether it had the potential to complicate the work of currently-serving intelligence officials. "Pouring gasoline on a fire now is not going to reduce the flame," he said. "And we've got enough fires burning right now, guys; we've got to focus on what are the outcomes we've got to achieve as a nation."